One year until yesterday, US vs China stocks, below. What does this mean: that global investors have rising trust of the US economy but flat or rising distrust of the China economy? More trust in Trump policies but less trust in Xi policies? CNN, BBC, NYT, others are among the top anti-Trump media outlets. 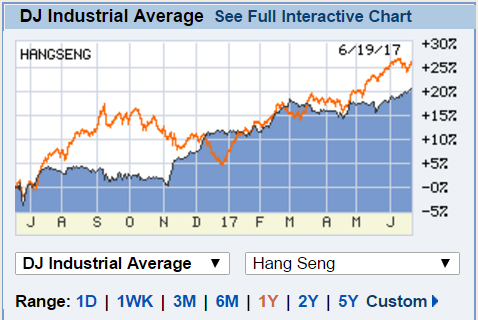 I checked Hong Kong's Hang Seng index, while the China stocks are declining, HK's are rising, faster than the growth in US stocks actually. I am a non-finance guy so I asked several friends about this development, including my friend in HK, Andrew S. if this means that there is a growing divergence in investor trust between the economies of the mainland and the HK SAR. I'm inclined to believe that the HK stock market has a positive, non-zero value to the overall HK economy because there is more rule of law, more policy stability in HK market than say, the PH or TH or ID or MY markets. Mr. Trump has been making plenty of economic, fiscal, energy policies that almost reverse the 8-yrs policies of Mr. Obama. 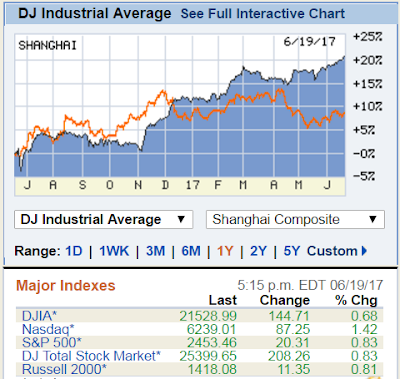 I am curious if Trump's policies were factored in positively by investors in the US stock market. Like the recent decline in world oil prices as reflection that Trump's energy policies are doing positively for the US. Shale oil frackers, coal producers, they are improving. And manufacturing, transport firms that are energy-intensive like airlines. "Remember the “energy independence” preoccupation of not so long ago? The U.S. is now emerging as the world’s energy superpower and U.S. oil and gas exports are rebalancing global markets. More remarkable still, this dominance was achieved by private U.S. investment, innovation and trade—not Washington central planning. Thanks largely to the domestic hydraulic fracturing revolution, the U.S. has been the world’s top natural gas producer since 2009, passing Russia, and the top producer of oil and petroleum hydrocarbons since 2014, passing Saudi Arabia." Trump's reversal of Obama energy policies is a big contributor to this. More shale gas and oil, more coal, production and exports. To surpass Russia in gas production and surpass Saudi Arabia in oil production is one big achievement. From the reports, biggest gainers yesterday were some pharma firms since Trump is trying to get rid of Obamacare. Like United Health Group, up 14.5% since Nov 6 2016. Meanwhile, China's market is "very very expensive for a long while" according to another friend, Peter A. This means the bubble is slowly crashing already? Hard to predict because China's communist government will never allow Freedom of information, will hide the real data. More globalization means more mobility of capital, labor and technology to markets worldwide that have more rule of law.